Gallia Academy senior Evan Wiseman (3) releases a shot attempt over a Coal Grove defender during the second half of Friday night’s OVC boys basketball contest in Centenary, Ohio. CENTENARY, Ohio — There was some rust, but it wasn’t anything a little defense couldn’t polish off. 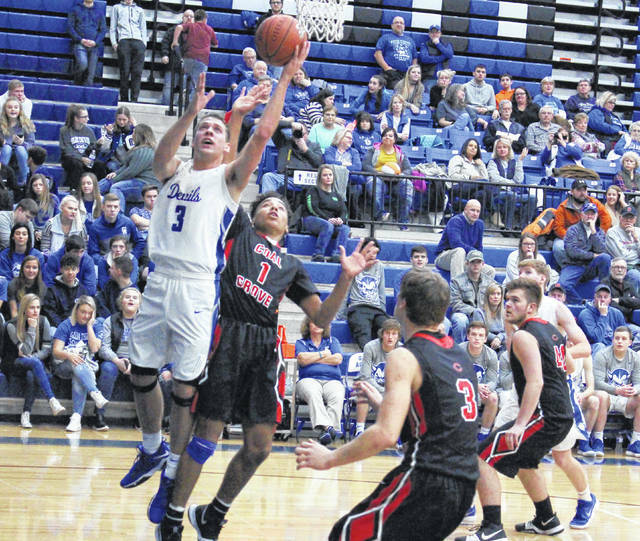 After an 18-day layoff, the Gallia Academy boys basketball team shined up its record by holding visiting Coal Grove to just 20 percent from the field en route to a 59-37 victory on Friday night in an Ohio Valley Conference contest in Gallia County. The Blue Devils (7-1, 3-1 OVC) led wire-to-wire and held the Hornets (6-3, 1-2) without a field goal in the opening quarter as the hosts scored the first six points and led 11-2 through eight minutes of play. CGHS — which missed its first 10 shot attempts — started the second canto with a small 5-1 run to close to within 12-7 with 5:55 remaining, but the Blue and White answered with a 15-8 charge over the next four-plus minutes as Logan Blouir’s basket with 1:11 remaining gave the hosts their largest lead of the first half at 27-15. 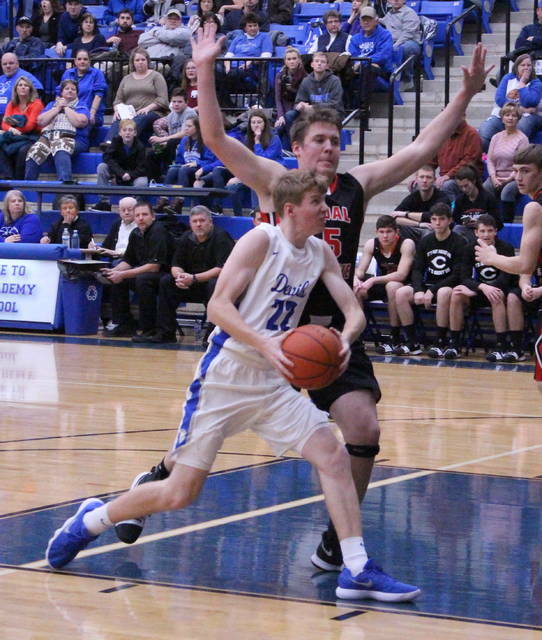 The Red and Black, however, received a pair of free throws from Aaron Music six seconds later, and neither team scored the rest of the way — allowing the Blue Devils to take a comfortable 27-17 cushion into the break. The Hornets — who netted only 4-of-23 field goal attempts in the opening 16 minutes — got a trifecta from Music 38 seconds into the second half, trimming the deficit down to seven points. The guests, however, were never closer the rest of the way. 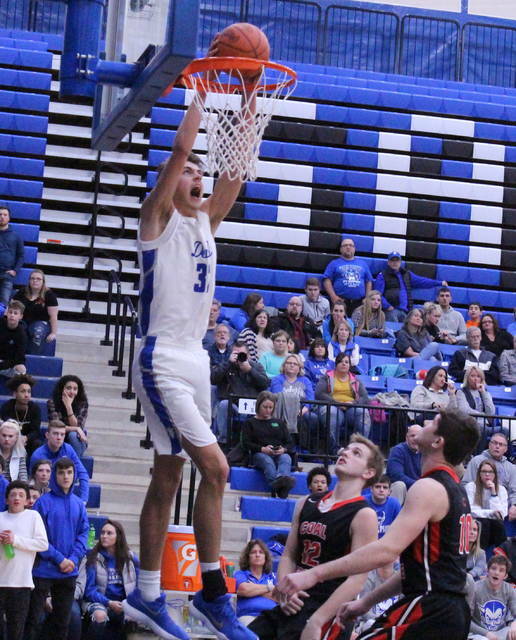 Zach Loveday capped a 6-0 run with a thunderous alley-oop dunk at the 4:08 mark for a 33-20 edge, then Loveday capped a 9-5 spurt with another alley-oop slam with 19 seconds left — giving the Blue Devils a commanding 42-25 advantage. Coal Grove got a single free throw from Jeb Jones with just two seconds left, which led to a 42-26 contest headed into the finale. Payton Smith scored five straight points at the start of the fourth, cutting the deficit down to 11 with 6:13 left to go. Gallia Academy, however, answered with eight straight points and eventually closed the final six minutes on a 17-6 surge to wrap up the 22-point triumph — the Devils’ largest lead of the night. After a 5-of-13 effort from the field in the opening frame, the hosts followed by connecting on 21-of-41 shot attempts the rest of the way en route to a 26-of-54 performance for 48 percent. Gallia Academy also committed only six of its 11 turnovers through three quarters of play and claimed a 38-23 overall advantage on the boards, including an 11-6 edge on the offensive glass. Loveday — Gallia Academy’s 7-foot-1 center — also provided some really big sparks after coming up one block shy of a triple-double performance. The sophomore produced only one rebound in the fourth and still finished the night with 18 points, 12 rebounds and nine blocked shots — all game-highs. Afterwards, GAHS coach Gary Harrison was pleased with the defensive intensity after holding a potent Coal Grove squad under 40 points — one of its lowest offensive outputs all year long. “We’ve stressed defense from day one, and holding Coal Grove to two points in the first quarter was really great to see after such a long layoff,” Harrison said. “We take a pride in our defense and we have all year. We did a really good job on the boards and (Zach) Loveday had a lot of blocks, so I feel that we are going to be really good defensively the rest of the way. Gallia Academy went just 2-of-11 from three-point range for 18 percent and also netted 5-of-12 free throw attempts for 42 percent. Evan Wiseman followed Loveday with 15 points and Caleb Henry tacked on 11 markers. Kaden Thomas and Cory Call were next with five points apiece, while Blouir and Blaine Carter completed the winning tally with respective efforts of three and two points. Henry followed Loveday with nine rebounds and Justin McClelland also hauled in five caroms for the victors. The Hornets went 10-of-50 from the floor and also made 4-of-18 shots behind the arc for 22 percent. The guests were 13-of-18 at the charity stripe for 72 percent. Music paced CGHS with 14 points, followed by Smith with seven points and Jones with five markers. Sam Angelo and Evan Gannon each contributed four points, while Elijah Roman and Cory Borders completed things with respective tallies of two points and one point. The Hornets — who committed eight of their 14 turnovers in the first half — were led by Music and Jones with six rebounds apiece. 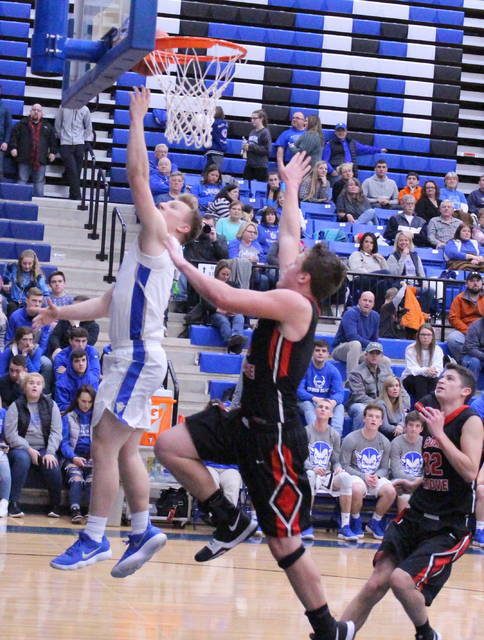 Gallia Academy played at Point Pleasant on Saturday night and returns to action Tuesday when it travels to South Point for an OVC contest at 7 p.m.